Brussels sprouts are in the Brassicaceae family which includes cabbage, collards, broccoli, kale and kohlrabi. They are a cold-hardy biennial that is cultivated for its small leafy green buds. 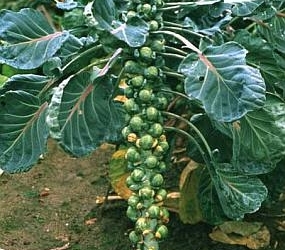 These bud-shaped sprouts, which resemble miniature cabbages, grow in a spiral array on the side of a long thick stalk. These stalks reach a height of approximately 2-4 feet in height and mature from the lower to the upper part of the stalk. If the plant over winters it shoots up into flowers and seeds in the spring. Since Brussels sprouts have a long growing season, the crop is often started in a greenhouse, cold frame or seedbed. The crop is then transplanted to the field in mid-April. Growers should time their planting so the sprouts are ready to pick after the first frost. The heads develop continually, so harvest is frequently over an extended period of time. The sprouts have their sweetest flavor when they are small and tightly wrapped. Overcooking Brussels sprouts releases sulfur compounds in the vegetable and give it an unpleasant smell. The larger leaves of the plant are edible and can be substituted for spinach in recipes. Brussels sprouts originated in Europe and have been grown near Brussels, Belgium for hundreds of years, hence the name.